Has Gibbs seen tomorrow's unemployment report? Weekly claims for unemployment continue to decline, and at a fairly impressive pace. This is undeniable evidence of ongoing improvement in the economy. It's something to cheer tonight as we toast the end of a bad year. It was a dreadful year for the millions of people who lost their jobs. But it ended up being a whole lot less bad than the great majority of people imagined it would be. That's the good news. The green line in the top chart is the market's breakeven inflation rate for TIPS, and it's pretty clear that the action in the last year has described a classic V-shaped recovery (in inflation expectations). One year ago the TIPS market was priced to zero inflation, now it's priced to inflation of almost 2.5%, which was the prevailing level prior to last year's financial crisis. To get to this point, Treasury yields have surged, while the real yields on TIPS have plunged. If the economy continues to improve and the Fed continues to drag its feet on whether to tighten or not, we can expect to see more of the same in the coming year: rising Treasury yields and flat to lower TIPS yields. More interesting, perhaps, is that a continuation of this past year's trends will quickly lead us to uncharted inflation-expectations territory. I've said many times here that the bond market is not a very good predictor of inflation, mainly because there are many times in the past when the bond market has been very slow to figure out the implications of the Fed's monetary policy. But it is true that the bond market sooner or later does figure things out, if only belatedly. I think we're seeing another instance of that right now. The second chart looks at the valuation of TIPS on a stand-alone basis, irrespective of what the market's inflation expectations are. Here we seen that TIPS have recovered some value of late, thanks to a modest rise in real yields, but they are still somewhat expensive by my estimation. What this all means is that the market is figuring out that monetary policy has an inflationary bias. 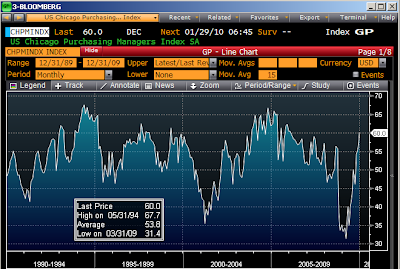 As a result, people are much more willing to buy TIPS than Treasuries. People are willing to pay a premium, if you will, for the inflation protection you get with TIPS. Bernanke & Co. should be following this development very closely. If I could get close to one of the Fed governors, I bet I would see a bit of sweat forming on his brow. In my predictions for 2010 I say that 10-year Treasury yields should rise significantly, ending up higher than 4.5% by the end of next year. Predicting sharply higher bond yields brings with it a prediction of higher mortgage rates, and that apparently makes a lot of folks very nervous about the housing market. I post this updated chart of mortgage rates to calm those fears. Even if 10-yr T-bond yields rose to 5%, that would probably result in 30-yr fixed mortgage rates of about 6.75% (conforming) and 7% or so (jumbo). In the great scheme of things, these are not very scary, and would amount to simply rolling back the clock to the late 1990s, when the housing boom was already underway. It's also important to note that we won't be seeing 5% Treasury yields until and unless the economy is doing appreciably better, and/or inflation is picking up. More inflation and stronger growth would imply higher incomes, and that, despite higher interest rates, would combine to keep housing more affordable for most folks than it has been for a long time. Higher rates would also give an impetus to buyers sitting on the fence: "buy now before rates go higher." Other folks worry that banks aren't lending. It certainly looks more difficult to get a loan today than it was just a few years ago. But at the same time, the Fed has already provided the banks with all they could possibly need to ramp up lending. In time they undoubtedly will, since the spread between banks' cost of funds and what they can charge consumers is huge, and the yield curve is very steep. Moreover, I'm not willing to underestimate the ability of this country's finance whizzes to figure out new ways of lending. We're in a period of great creative destruction, and innovation is more likely than stagnation at times like these. Is Fed tightening a threat to growth? No. Interest rates are ridiculously low right now. So low, in fact, that they make a lot of people nervous about the future: How will the Fed exit its quantitative easing strategy; how high might inflation go; what if China stops buying our debt? These concerns weigh heavily on the dollar, which is very close to its all-time lows. That in turn makes global investors think twice about putting their money to work in the U.S. The uncertainty surrounding monetary policy and the problems this poses for investment is a major headwind for the economy right now. Markets would be much happier, and growth fundamentals much stronger, if the Fed were to surprise people by snugging up monetary policy tomorrow. Doing the right thing is always better than continuing to make a mistake. So I'm not worried about higher interest rates. In fact, I welcome them and hope they come sooner rather than later. No economy that I'm aware of has ever been able to fool its way to stronger growth and higher living standards by debasing its currency. The Chicago Purchasing Managers' Index has risen rather dramatically this past year, joining the rapidly growing list of signs and symptoms of a V-shaped recovery. I've been arguing for a long time that this recovery would be V-shaped, that once the financial markets got back on their feet and confidence started returning, the recovery would feed on itself--a virtuous cycle, if you will. It's very hard to derail a process such as this. I know that the recovery skeptics point to all sorts of dreadful things that await us as the housing market experiences another wave of defaults and commercial real estate struggles with high vacancy rates and its own wave of defaults, and as the nation struggles with high unemployment and trillion-dollar deficits. But all of those become less dreadful if the underlying economy is picking up. And in any event, defaults don't kill growth, they merely transfer wealth. Housing price declines don't kill growth either; rather, they allow new owners to buy a home they otherwise couldn't afford. High unemployment doesn't kill growth, it is a manifestation of slow or weak growth: an effect, not a cause. Deficits don't kill growth either, but they do slow down the recovery since they are caused mainly by massive government transfer payments which don't produce much in the way of productive activity, if any. Following the tradition I started one year ago, in which my predictions for 2009 proved amazingly accurate, here’s what I think will happen to the economy and the markets in 2010. Caveat: last year’s accuracy provides no assurance whatsoever that this year’s predictions will be accurate or profitable. Inflation: Inflation hit a low ebb one year ago, and has been trending slowly higher since. I think inflation will continue to trend slowly higher, because all of the key leading indicators of inflation are still saying that monetary policy is accommodative: the dollar is weak, gold is strong, the yield curve is very steep, commodities are strong, breakeven inflation rates on TIPS are rising, and credit spreads are declining. I don’t see significant inflation on the horizon, but I do believe that inflation will exceed the breakeven expectations implied in the pricing of TIPS, which are currently in the neighborhood of 2-2.5%. Growth: Thanks to a return to more normal financial market conditions, an abundance of signs that economic fundamentals are improving on the margin, and the growing pushback that is emerging against Obama’s hard-left agenda (an important development that has helped the market for most of this year), I believe the economy will grow 3-4% over the course of the year. While this represents an above-average growth rate from an historical perspective, it will be a distinctly sub-par recovery given the depth of the recession which ended about six months ago. I think the main reason for sub-par performance will be the misguided and bloated Keynesian stimulus policies enacted earlier this year, coupled with a significant increase in government regulatory burdens and government spending (mostly in the form of transfer payments), and huge federal borrowing requirements. (Not surprisingly, this puts me at odds with most Keynesian forecasters, who generally believe that the winding down of stimulus spending will cause the economy to slump in the second half of the year. Where they see slower stimulus spending hurting the economy, I see stimulus spending acting all along as a obstacle to recovery.) If the economy manages to exceed 3-4% growth, it will likely be due to the fact that corporations and individuals have a strong incentive to accelerate the receipt of income this coming year, in order to avoid the higher tax rates that are slated to take effect at the beginning of 2011. Fed: The market currently expects the Fed to begin raising short-term interest rates in June, and the current year-end expected Fed Funds rate is approximately 1.0%. Given my relatively optimistic outlook for the economy, and my belief that inflation is likely to trend higher, I think the Fed will end up raising rates sooner and/or somewhat more aggressively than the market currently expects. Housing: Residential construction activity is likely to slowly but gradually improve over the course of the year. Housing prices on average are likely to post modest gains as well, thanks to improving economic activity, rising incomes, relatively low interest rates, and accommodative monetary policy. Prices could dip briefly as a result of increased foreclosure activity in the first half, but this should prove to be only a temporary setback. Rising mortgage rates, since they will still be relatively low from an historical perspective, should do more to encourage a "buy it now" mentality than to discourage would-be buyers who will see that in many areas homes are more affordable than ever. Interest rates: Interest rates on Treasury bills, notes and bonds should rise significantly over the course of the year, with 10-yr T-bond yields exceeding 4.5%. The impetus for higher rates will be a stronger-than-expected economy, and higher-than-expected inflation. Higher rates will not threaten the recovery, however, since they will occur largely as a result of the recovery. Moreover, even though I see the Fed tightening sooner than expected, I nevertheless expect them to be “behind the curve” throughout the year, much as occurred with monetary policy in the 1970s (i.e., the Fed will wait too long to raise rates and is unlikely to raise them by enough to quickly dampen inflation pressures). There is very little risk that Fed policy will be anywhere near tight enough next year to threaten the economy. MBS spreads: Since the Fed plans to cease its purchases of MBS by March, this could push MBS spreads wider over the next few months. Regardless, MBS spreads are likely to widen over the course of the year. The main impetus for wider MBS spreads next year is likely to come from an across-the-board increase in the extension risk of MBS as Treasury yields rise. Credit spreads: Credit spreads are likely to decline gradually over the course of the year. Easy money and a strengthening economy add up to a perfect environment for spread tightening. Easy money that leads to higher inflation and improved cash flows is a boon to borrowers, especially the most indebted ones, and that means lenders will be rewarded by lower than expected default rates. High-yield bonds and emerging market debt should be the biggest beneficiaries of tighter spreads. Equities: Equity prices are likely to experience a few dips along the way, but they should be at least 10-20% higher by the end of the year. The onset of Fed tightening may provoke a temporary selloff, but in the end a Fed tightening is just what the economy and the markets really need to build confidence in the dollar and in the future of the economy. The main impetus to higher equity prices will be an improving economy and improving corporate profits. Commodities: Commodity prices will continue to work their way higher over the course of the year, buoyed by an ongoing improvement in global growth conditions and accommodative monetary policy. Gold: Gold prices are likely to spike one more time to a new high this coming year. Gold speculators will be encouraged to see that the Fed is “behind the curve” and reluctant to tighten boldly and aggressively. However, gold is a highly speculative investment at these levels, and not for the faint of heart. In the long run, gold's downside potential now greatly exceeds its upside potential. Dollar: The dollar is near enough to its all-time lows, both in nominal and in real terms, that it is likely to rise at least modestly against most major currencies, and it should be able to hold near its current levels against most emerging market and commodity currencies. The dollar will find support from Fed tightening, and from the growing realization that the economy is getting stronger despite all the concerns about the disturbing trends in fiscal policy and the ongoing defaults in the residential and commercial real estate markets. Just wanted to let you know that the past week has been amazing out here in Waikiki. Tons of people from all over the world (Japan, Australia, South America, Canadians, and strangely, Americans) have been spending $ as if it were burning a hole in their pockets. We haven't seen it like this in two years, maybe three. Sales have quadrupled. People are saying that it should continue at least through mid- January. It's amazing. A quick look at commodity prices says that the growth story is still strong. These two indices of industrial commodity prices today are both at new highs for the year. This is undoubtedly a reflection of an ongoing and significant rebound in global activity. As such, it supports an optimistic view of the future of U.S. growth prospects. Last year was a horrible year, but with action like this, the memory is fading fast. This chart plots the implied volatility of equity and T-bond options, and thus is a good proxy for the level of fear, uncertainty and doubt (FUD) that inhabits the market. The market has effectively breathed a huge sigh of relief this past year. Implied volatility hasn't yet returned to levels that would be consistent with tranquil economic and financial conditions, but it's coming into view. Part of this improvement is due to the shifting winds of politics; a good portion of Obama's destructive policy agenda (e.g., cap and trade, card check) has been derailed, while others (healthcare) have received considerable push-back from members of his own party. In fact, the hard-left policy agenda he has been pushing increasing appears to be out of sync with the desires of the electorate. Back in early March the market looking with great fear and trembling at the prospects of a fiscal train wreck culminating in a sweeping expansion of government powers and awesome tax increases; the worst-case scenario which seemed likely then is much less likely now. Part of the improvement can be chalked up to emergency measures on the part of Treasury and the Fed which helped restore confidence in the banking system and averted a debilitating deflation. This in turn provided the necessary backdrop for the economy to pursue its own process of recovery. I view this improvement in financial conditions as one of the key economic fundamentals supporting an optimistic outlook for growth in the coming year. Markets abhor FUD and risk in general, and that explains why economies generally have great difficulty posting healthy growth when conditions are highly uncertain. The greatly reduced level of perceived risk that is evident in this chart should translate directly into improved growth conditions, since it means reduced transaction costs, lower borrowing costs, and greatly reduced systemic risk. As of the most recent data (2007), consumers paid for only 12% of their healthcare expenses out of their own pocket. Back in the days before WW II, consumers paid for the vast majority of their healthcare expenses out of pocket. That began to change in the early 1950s, when the government agreed to allow companies to circumvent existing war-time wage controls by giving their workers tax-free health insurance; companies could deduct the cost of the insurance, while it wasn't considered income to the workers. This significant feature of the tax code has finally taken us to its logical conclusion: consumers now get almost all of their healthcare paid for by an employer, since this is highly tax-efficient. The 12% that is still paid out of pocket likely consists mostly of payments by individuals not covered by employer policies, and co-pays by individuals that are covered. Since the vast majority of healthcare expenditures are not paid for by those receiving healthcare services (but rather by a third party insurer or the government), there exists little or no incentive for consumers to shop around. There is a notorious lack of price transparency in the healthcare market, and costs have risen inexorably at a rate much higher than inflation. Suppose the government created a new category of nontaxable compensation for employees that would allow employers to offer "food insurance" to their employees. Employers could deduct the cost of the food insurance, and employees would enjoy a considerable tax-free benefit. Eventually just about every employer would offer a plan that might look something like this: for a co-pay of $15 everytime you visit the supermarket, you could walk out the door with almost anything you wanted, provided it fit into a shopping cart. Those with special needs (e.g., birthday parties, anniversaries, large families) could petition their insurance company for an exemption to this restriction, and insurance policies would undoubtedly carry lifetime food allowance limits that would cover the reasonable needs of just about everyone. What do you suppose would happen to the cost of food? Would filet mignon be in scarce supply relative to hamburger meat? Would anyone buy lettuce by the head, or would it all be sold chopped up in bags and ready to eat? Would stores bother to put prices on the cans and boxes of food? Would stores bother to advertise the fact that their prices were lower? How much more food would be thrown out uneaten by U.S. households? Would food become more available or less? Would everyone become outraged over how much it cost to buy food insurance policies? To fix most of what is wrong with healthcare, we simply need to fix the tax code. Either allow everyone to deduct the cost of healthcare, or no one. That would quickly restore the proper incentives to consumers, since almost everyone would end up paying for healthcare insurance out of their own pocket or choosing not to buy policies. Yields on 10-year Treasury bonds are a handy barometer of the market's economic optimism. Yields plunged late last year to 2%—a level not seen since the Great Depression—as the market came to fear that the economy was headed for a severe depression and deflation. Yields are now headed back 4%, which—in my view—is a level consistent with an economy that is only capable of managing meager growth with very low inflation. Yields would have to go well over 4% and approach 5% before I would say that the market's expectation of our economic future was anything close to "normal." So the market is still gloomy, but not catatonic as it was a year ago. Rising bond yields reflect improving sentiment on the margin, and that goes hand in hand with the Fed moving sooner, rather than later, to reverse its quantitative easing and push short-term interest rates higher. This is not a threat to the economy, this is a natural consequence of the economy doing better than expected. The Fed would need to raise short-term rates to at least 5% before anyone could argue that money was tight enough to threaten the economy. Historically, it has taken one or more years of a real Fed funds rate of 4% or more before the economy succumbs to tight money and slides into a recession. And since the yield curve today is as steep as its ever been, we know the market is already prepared for significantly higher short-term interest rates over the next few years. The real problem would be if the Fed failed to raise rates in a timely fashion, since that would likely result in higher inflation and eventually another round of tight money and a protracted recession. Japanese industrial production suffered the most in last year's downturn, so it's not surprising that it has also rebounded the most this year, rising fully 27% from its Feb. '09 lows. This is an important sign of the strength of the global recovery, which this time around is helping pull the U.S. economy out of its slump (the U.S. is typically the engine of global recovery). Sending the same message of a strong global economic rebound, the Hang Seng equity index is up 89% from its March low and 49% year to date, and most Asian stock markets have turned in performances that handily beat the S&P 500's 25% return year to date. 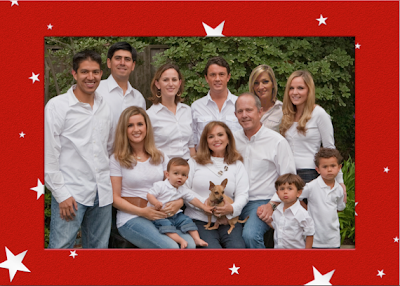 .. from my family to yours. When I think back to a year ago, I realize this has been a great year. Not a perfect year, of course, but much better than most people would have expected. It hasn't been the end of the world as we know it. The financial crisis has passed, and the economy is improving. We hope that things will continue to improve. In the meantime, we are fortunate to have all of our children and grandchildren—with the exception of my son and his fiancee who live in Hawaii—with us tonight. My job today is to fix the turkey and prepare the gravy and mashed potatoes. This year I've added a mushroom casserole thanks to my Aunt's recipe. My wife is doing a leg of lamb and a ham, and our friends and relatives (we'll have about 35 for dinner tonight) are bringing the rest. It's a wonderful tradition that is enjoyed by old and young, and if all goes well we'll be toasting with champagne and dancing come midnight. Business investment is definitely picking up, with new orders for capital goods about 10% higher in November than they were at the low last April. Capex is still woefully below the levels it reached in the booming late-90s, but it is following the typical pattern in which it rebounds as a recession ends. It will take us many years to return to the heydays of the past, but at least we are moving in the right direction. Fatal flaw #1: The penalty imposed for not buying a policy is very likely to be less than the cost of insurance for a great many people. This, combined with the requirement that insurance companies may not deny coverage to anyone with a pre-existing condition, means that a large number of people will forgo signing up for a policy, knowing that they a) will save money and b) can always sign up for insurance if they turn out to develop a serious medical condition. Thus, the actual revenues will far way short of projections. Fatal flaw #2: Mandating that people buy a health insurance policy simply because they are alive is unconstitutional. It is also a way of hiding the fact that young people will effectively be paying a huge new tax in order to subsidize older people. Fatal flaw #3: Regulating the price which insurance companies must charge for policies, coupled with a requirement that companies must rebate to their customers the amount by which their loss ratios fall below 90%, effectively turns these companies into government-run enterprises and would likely result in the effective nationalization of the healthcare industry, something that the CBO has also noted. That is a violation of the Fifth Amendment, and of a Supreme Court requirement "that any firm in a regulated market be allowed to recover a risk-adjusted competitive rate of return on its accumulated capital investment." Our world is full of complexities that defy human engineering. Attempts to consciously redesign the health care industry are ... hubristic and hazardous. That industry is one of billions of unique, often personal, relationships, each of which is part of countless long chains of efforts to transform raw materials and human effort into life-improving and life-saving drugs and treatments. Like weather and the mysteries of love, these long chains of human relationships weren't designed by anyone. Like weather and love, they change, often unexpectedly; they also possess as many unique properties as there are persons involved. And like weather and love, their all-important details are beyond the comprehension of would-be redesigners. These long chains of human relationships cannot be undone and reassembled at will by politicians and "experts" without risking enormous and unintended catastrophe. It's as if a committee of engineers trying to design, say, a bridge to connect New York and London draft a blueprint that is so huge and complex that none of the engineers can possibly comprehend its details. No engineer knows, or can know, exactly what it is he or she is helping to engineer. If an engineer can't read and understand even his own blueprint, why should we trust him to understand the vastly more complex reality that his blueprint allegedly represents? And, more importantly, why should we trust that what is built based upon the incomprehensible blueprint will work as advertised? With hundreds of millions of customers ... the idea that 535 geniuses on Capitol Hill can design this industry so that it will improve human well-being is laughable. There are steps that Congress can sensibly take, but all of these involve removing government-imposed restrictions on the abilities of individuals to seek out, and to supply, health care provision within markets. Health care will be improved only by unleashing the creativity of millions of people and by market competition. Health care will be severely damaged if it is designed and restricted by a few hundred arrogant political operatives. Today the Bloomberg index of financial conditions moved into positive territory for the first time since July 2007. This ranks as one of the best indicators of a V-shaped recovery that I've seen. The financial markets have largely healed, and that is a precondition for healing to spread and normalcy to return to the rest of the economy. This is very supportive of an optimistic outlook for growth next year. HT: Mark Perry, who has a more detailed chart of this index over the past two years. Every time I post an update of this chart I seem to get a number of incredulous responses. What the chart shows is that households' financial burdens are, on average, lower today than at any time in the past five years. Moreover, they are not any worse today than they were in 2001, and financial burdens have not risen materially for the past three decades. What most people believe, however, is very different: there seems to be a consensus out there that households are over-stretched and over-burdened by debt. Many people have indeed succumbed to mortgage and credit card debt, but the great majority, as suggested by this chart, have managed to stay afloat and have even reduced their debt burden over the past two years. It's very hard—if not impossible—to get from this chart to a conclusion that there is anything seriously wrong with households' finances. I think this is very supportive of an optimistic outlook for growth going forward. What's more important: the news that third quarter GDP was revised down to only 2.2%, from an original estimate of 3.5%? Or the news that credit spreads continue to decline yet are still at levels that in the past have been consistent with recessionary conditions? I'll take the spread news any day, since it's real-time, and not subject to revision. GDP news is always old and always subject to revision. The downward revision to GDP amounts to only $46 billion, when you de-annualize the numbers. That's a rounding error these days. Heck, the federal government alone spends that much money in fewer than 5 working days. The important thing about the GDP numbers is the change on the margin. Q1=-6.4%, Q2=-0.7%, Q3=2.2%. Going from minus 6.4% growth to plus 2.2% growth, that's a big deal. And growth in the current quarter is very likely to be higher than 2.2%. Things are improving significantly on the margin. Declining credit spreads tell us that the outlook for the economy is improving almost daily. Cash flows are stronger, profits are stronger, default risk is declining. Unemployment claims tell us the same thing: fewer people are getting laid off, more people who have been laid off are finding jobs. Rising commodity prices tell us that global growth is improving. Implied volatility in equity options today reached a new low for the year, and that tells us that confidence is returning and uncertainty is diminishing. The equity market is grudgingly coming to terms with the improvement, but still has along way to go, just as credit spreads have a long way to go before they get back to "normal" levels. The dollar is strengthening on the margin, which means that conditions here are turning out to be better than they world had thought. The dollar is still extremely weak, of course, but on the margin it's getting better. Same can be said for the economy: there is a whole lot of idle capacity out there, and many millions without a job, but things are getting better on the margin. I don't see a reason for all this improvement to suddenly falter. The news from Washington has been awful all year, and I am just as dismayed as anyone that ObamaCare has advanced as far as it has. But on the margin the clear message is that the people increasingly don't like the far-left agenda. There is a significant amount of resistance brewing out there, and the people will have their revenge in November if the politicians persist in pursuing a wrong-headed policy direction. Even if healthcare passes, it is going to be mired in lawsuits and consitutional challenges for many years. Obama's greatest legacy might not be the one he dreams of. Instead of permanently and massively expanding the role of the state, he may end up being the catalyst for a new political awakening, and a return to this country's libertarian roots. That would be the most astounding change on the margin imaginable. The news from the housing sector continues to be excellent. The surge in sales in recent months was undoubtedly helped by the anticipated expiration of the tax credit for first-time buyers, but I don't think we can dismiss this news entirely (not least because the credit has been extended). Sales are up no matter how you look at it. This market is now clearing, which means that prices have fully adjusted to the new realities. House prices are down and interest rates are down, making housing more affordable now than it has been in many decades. The inventory of homes for sale has shrunk dramatically, thus making room for all the homes that will be coming on the market as the result of the "second wave of foreclosures" that the world has been fretting about for most of the year. It's extremely significant that the housing market has cleared to this extent. Prices are no longer falling, and that puts an end to the fears of a downward spiral that would undermine the balance sheets of the institutions holding mortgage-backed paper. It also restores confidence to the housing sector, as people realize that they are no longer trapped with a depreciating asset. Household balance sheets are again improving. Those who want to move to where there are more jobs, can. Life goes on, and things get better, and that's the way it should be. A lot of the plans that got put on hold a year or so ago are now being put back on the drawing board. The latest Rasmussen survey shows Obama's approval ratings are in free-fall. Almost half of the people "strongly disapprove" of the way he is handling his job. This is unprecedented (to use one of Obama's favorite words) for the first year of a presidency, especially considering his lofty approval ratings just one year ago. If Obama and the Democrats persist in passing the Reid healthcare bill, I suspect these ratings will go even lower. As I have been arguing since last February, the country was never ready nor eager for the radical left-wing agenda that Obama has been bent on rahmming through, and these ratings are proof. The people are speaking, and they've had just about enough of this. Will Congressional Democrats take notice before it's too late? Here's a quick recap of the predictions I made last year. I'll never have a better year of forecasting. All measures of inflation will head higher. Correct. Headline inflation was negative in the final months of last year, and core inflation barely avoided a negative print. The CPI rose throughout the year and was up at a 4.2% annualized pace in the six months ending in November, while the core CPI was up at a 1.5% rate over the same period. The economy is going to recover sooner than the market expects, with the bottom in activity coming before mid-2009. Almost spot-on. The official pronouncement of the recession's end won't come until later next year, but for now it looks like the recession ended in late June or early July. The economy greatly exceeded almost everyone's expectations. Residential construction was bottoming, and housing prices would begin rising well before mid-year. Correct. Housing starts hit bottom in April and as of November were up 20% from their lows. According to the Case-Shiller index of housing prices in 20 major markets, housing prices hit bottom sometime around March, and were up 5% from their lows as of the September release. Treasury yields will be significantly higher by the end of next year. TIPS yields will hold steady or fall as nominal yields rise. Correct. 10-year Treasury yields have risen from 2.1% at the end of last year to 3.6%. 10-yr TIPS real yields have fallen from 2.1% to 1.3%. Credit spreads have seen their highs and will continue to narrow. Correct. Spreads actually plunged over the course of the year, leading to the biggest rally in corporate debt on record. Equity prices will lag other risk asset prices, but they will be significantly higher by the end of next year. Correct. To date, the S&P 500 has generated a total return of about 25%, after plunging to a frightening low in early March. Gold is also up about 25%, after earlier posting a gain of almost 38%. Commodity prices may take awhile to move higher, but they will be higher within 2 years. Oil prices are unlikely to drop below $35. Correct. Commodities rose throughout the year and are now up over 30%. Crude oil has almost doubled this year, after briefly dipping to a low of $36.50 in mid-January. The dollar is unlikely to make further gains against most major currencies, given the Fed's hyper-easy stance, and is likely to fall against emerging market currencies as commodity prices rise. Almost spot-on. The dollar rallied through April, but so far is down about 5% against major currencies for the year. The dollar fell significantly against the currencies of most emerging market currencies. I'll have my fearless 2010 forecast out by next week. Fatal flaw #1: The penalty imposed for not buying a policy is very likely to be less than the cost of insurance for a great many people. This, combined with the requirement that insurance companies may not deny coverage to anyone with a pre-existing condition, means that a large number of people will forego signing up for a policy, knowing that they a) will save money and b) can always sign up for insurance if they turn out to develop a serious medical condition. Thus, the actual revenues will far way short of projections. Fatal flaw #3: Regulating the price which insurance companies must charge for policies, coupled with a requirement that companies must rebate to their customers the amount by which their loss ratios fall below 90%, effectively turns these companies into government-run enterprises and would likely result in the effective nationalization of the healthcare industry, something that the CBO has also noted. That is a violation of the Fifth Amendment, and of a Supreme Court requirement "that any firm in a regulated market be allowed to recover a risk-adjusted competitive rate of return on its accumulated capital investment." Richard Epstein has a detailed article explaining this here: "Impermissible Ratemaking in Health-Insurance Reform: Why the Reid Bill is Unconstitutional"
As Epstein notes at the end of the article, there are so many problems with this bill that at the very least it will take many, many years to implement. This ill-conceived legislation has many provisions that regulate different aspects of private health-insurance companies. Taken together, the combined force of these provisions raises serious constitutional questions. I think that these provisions are so intertwined with the rest of the legislation that it is difficult to see how the entire statute could survive if one of its components is defective to its core. How courts will deal with these difficult issues is of course not known, but rate-regulation cases normally attract a higher level of scrutiny than, say, land-use decisions. There is, moreover, no quick fix that will eliminate the Reid Bill's major constitutional defects. It would, of course, be a catastrophe if the Congress sought to put this program into place before its constitutionality were tested. Most ratemaking challenges are done on the strength of the record, and I see no reason why a court would let a health-insurance company be driven into bankruptcy before it could present its case that the mixture of regulations and subsidies makes it impossible to earn a reasonable return on its capital. At the very least, therefore, there are massive problems of delayed implementation that will plague any health-care legislation from the date of its passage. I should add that the many broad delegations to key administrative officials will themselves give rise to major delays and additional challenges on statutory or constitutional grounds. UPDATE: The WSJ now has a much better and easier-to-understand version of Epstein' article here. According to BanxQuote, the nationwide average for 30-year fixed-rate conforming mortgages yesterday was 5.03%. Call it 5%. I seriously doubt whether we'll see this rate go much lower, and I think there is a very good chance it will be moving higher next year. If you're in the market for a home, this is most likely your last chance to lock in what are essentially the lowest fixed rates on mortgages in history. The Fed has been buying hundreds of billions of mortgages since last March, and will continue to do so for the next few months. But it's not clear that this has produced a significant decline in mortgage rates (see my earlier post on this subject), and it's questionable whether the Fed can keep rates from rising going forward. As the second chart shows, the spread between wholesale mortgage rates and 10-year Treasuries is about as low as it has ever been. And as the next chart shows, 10-year Treasury yields are creeping higher. They have been unusually low this year mainly because the market has worried that the U.S. economy was very weak. With every day that passes, we see more evidence that the economy is getting stronger. As the next chart shows, the spread between 2- and 10-year Treasury yields is now as wide as it has ever been, driven largely by rising yields on 10-year Treasury bonds. This unprecedented (to use one of Obama's favorite words) steepness of the yield curve is a powerful signal of recovery, and it also reflects rising inflation pressures. As a confirmation of that, I note that the 5-year, 5-year forward breakeven spread on TIPS reached 2.8% today, its highest level since early last year. The Fed has awesome power, but it can't keep bond yields from rising. The more the Fed insists on keeping short-term rates low, the more this fuels inflation concerns, and that in turn pushes long-term yields higher. The harder the Fed tries to keep rates low, the more likely it becomes that rates will move higher. Now that the politicians of both parties have led us to the brink of fiscal destruction—the unfunded deficits of social security and medicare were already staggering, and now healthcare reform could up the ante by an order of magnitude, while attempts to "save the planet" could create a global government bent on transferring significant wealth from rich nations to poor nations while also mandating a switch to more expensive energy sources—the ideological battleground is emerging in stark relief. It's not about Democrats vs. Republicans, or liberals vs. conservatives, it's about government power vs. individual liberty. The “conservative/liberal” division – although thought of in America today as the two alternative, relevant “sides” of political opinion – is no such thing. If we talk seriously of two “sides,” a much more realistic division is between those persons with a fetish for centralized power and those persons who distrust such power. Modern “liberals” long for Washington to design and control the economy in great detail. Modern conservatives look to government to engineer the polity’s moral tone... Despite their differences on particular policy issues, both modern “liberals” and conservatives have a fetish for centralized coercion. So the side opposite both the modern “liberal” and conservative is occupied by those persons who are neither conservative nor “liberal” but, rather, deeply suspicious of entrusting government with power. And these “power skeptics,” as we might call them, are far more willing than are “liberals” and conservatives to let individual men and women choose their own courses in life – to buy and sell and work as they wish; to save and invest – and ingest – as they choose; to partner with each other romantically, socially, and commercially in whatever peaceful ways they like and never in ways that they dislike; to keep the full fruits of their efforts and risk-taking, and not be coerced into subsidizing those who are less industrious or adventurous; and not to be forced to support military adventures that have no direct and compelling relationship to the protection of peace and property at home. This is the nature of the political debate we should be having: Obama's agenda for a massive expansion of government, versus the platform that seems to be emerging from the Tea Parties. The Tea Parties are revealing a new political platform that has been obscured for decades by those who argue about whether the government should regulate such things as abortion, immigration, and marriage. Those debates were all about government intrusion in our lives. The new platform takes us back to our country's roots: less government, not more; less spending, not more; lower taxes, not higher; less coercion, not more; citizen politicians, not professionals. These are turbulent times, but, as Charles Krauthammer points out, they are also "politically and intellectually invigorating." Let the true battle begin. The stakes haven't been so high in generations. The dollar is up almost 5% from its low of last month, but commodity prices are still rising across the board. These charts show the Journal of Commerce commodity price index (top chart), followed by the four sub-categories of the same index. All are indexed so that their price is equal to 100 at the time the 2001 recession ended. The bounce in the dollar has had virtually no impact on commodity prices in recent weeks, which in turn suggests that commodity prices of late are being driven primarily by strength in global demand. However, that does not necessarily imply that there is no monetary inflation going on in the commodity markets, since it's entirely possible that all currencies are experiencing a monetary debasement, and the dollar has merely enjoyed a three-week reprieve. Regardless of what's causing the rise in commodity prices, it is likely some combination of a) a resurgence in global growth, and b) very accommodative monetary policies around the world. Whichever is dominant is anyone's guess, but it is not a stretch to say that strong commodity prices rule out both a renewed economic slump and the threat of deflation. Therefore, these charts add up to a bullish outlook on growth. The 4-week moving average of weekly claims for unemployment continues to move lower. I contrast this to the headline I see on Bloomberg this morning: "The dollar rose to the highest level in three months against the euro while stocks and commodities slid as investors shunned risky assets on concern the global economic rebound will stall. Treasuries rallied." I don't see any sign of a global economic stall. Instead, I see markets that are still shell-shocked, still trading at levels that imply a great deal of concern for the future. Why else would someone believe that a stronger dollar—which is only a few percentage points above its all-time lows—is a reason to not buy U.S. assets with otherwise-attractive yields? Yet another update on this important measure of the likelihood of corporate defaults. Credit spreads have fallen dramatically over the past year, resulting in spectacular performance for corporate bonds of all stripes. When spreads were soaring at the end of last year, it was because the market was bracing for an extended depression and an accompanying deflation. Things didn't turn out quite so bad, so now the market is braced for a run-of-the mill recession. There's still lots of room for improvement, especially now that the Fed once again has assurred us that they are not going to upset the economic applecart by raising rates anytime soon. When cash yields zero, while other things, like investment grade bonds, junk bonds and emerging market debt carry yields that are still quite high relative to Treasury yields, then to hold cash and not more risky bonds only makes sense if you think the economic outlook is going to deteriorate materially. With credit spreads still at levels that in the past have been consistent with the onset of recession, the bond market is priced to a deteriorating economy. To lose money in corporate bonds, therefore, the economy has to really deteriorate. The Fed is doing its best to minimize that risk, and it is also making the odds of winning a corporate bond bet as high as possible, by keeping cash yields at zero. You should never fight the Fed. On a related issue, I note that the spread between 2-year and 10-year Treasuries today is as high as it has ever been. A very steep yield curve, such as we have today, is the market's way of telling you that the Fed is expected to raise rates by leaps and bounds at some point in the future. (For example, 10-year Treasury yields imply that the Fed funds rate will average 3.5% over the next 10 years.) In other words, today's steep curve tells you that the market is braced for a significant Fed tightening. The only real uncertainty is when the Fed will start to raise rates. For the Fed to upset the market's applecart, they would have to either a) start raising rates very soon and very fast, or b) not raise rates for a very long time, and then by not very much. To the extent you think both of these alternatives are unlikely, then you should avoid holding cash. Full disclosure: I am long a variety of funds that invest in corporate, high yield and emerging market debt, and I have zero cash holdings at the time of this writing. These two charts show year over year changes in the consumer and producer price indices, the top chart showing total, or "headline" inflation, while the bottom chart shows just "core" inflation (excluding food and energy). Energy prices are a big part of the current headline numbers, as the difference between these two charts illustrates. Looking at all prices, inflation has jumped rapidly from negative to back to where it was on average over the past decade or so (about 2%). But on the margin, the jump is even more impressive: in the past six months, consumer prices are up at a 4.2% annualized rate, and producer prices are up at a 8.3% annualized rate. Looking at core prices, inflation is subdued, with the Core CPI rising at a 1.5% annualized rate in the past six months, and the Core PPI rising at a 0.7% rate. If you're willing to ignore energy prices, then you could agree with the Fed that inflation is far from being a concern these days. If not, though, then you would be pounding the FOMC table today to reverse the quantitative easing ASAP. I'm willing to concede that energy is indeed volatile, and since energy prices are down this month relative to last month, that their impact in future inflation statistics is going to be minimal. But I continue to believe that the level of core inflation is "the dog that didn't bark," in the sense that it should be far lower than it is, if the Fed's theory of inflation is correct. The economy is still very weak, and there is an awful lot of "resource slack" out there. If resource slack is the thing the Fed is betting on to keep inflation subdued for the foreseeable future, then the Fed governors ought to be pretty nervous right now, because the Core CPI is only half a percent below the Fed's upper target of 2%. The bond market ought to be more nervous too, since breakeven inflation rates on TIPS maturing in 5 years or less is 1.5-2%. I doubt the FOMC will acknowledge this reality in its statement today, but if they did I would feel a lot better about things. Not every sector of the economy is in a V-shaped recovery. Based on housing starts data so far this year, residential construction is in a U-shaped recovery. It sure looks like it's hit bottom, but the upturn is relatively anemic. I look for more improvement over the course of next year, but of the slow type, not dramatic. In a recent post on Carpe Diem, Mark Perry notes that year over year M2 growth is now at its lowest point since the beginning of 2005, and asks "Wouldn't M2 money growth have to be much higher to fuel the kind of inflation many are worried about?" A standard monetarist answer to his question would be "yes." But in my experience the connection between M2 and inflation can be quite convoluted, to say the least. Let me explain this by first noting that the connection between M2 money growth (M2 being the most reliable, enduring and meaningful measure of "money" that I'm aware of) and inflation is not always what one would expect. Milton Friedman was one of the best economists of the past century, but his inflation forecasts over the past three decades, based on his observations of M2 growth, were often famously off the mark. Here are two charts which illustrate the difficulty of relating M2 growth to inflation. In the first chart I show the 2-year annualized growth rate of M2, with an overlay of different colors which depict periods of rising and falling inflation. I use the 2-year growth rate of M2 to smooth out the monthly fluctations and focus on the trend, and also to recognize that there is a lag between money growth and inflation. If money growth is high for one year and then low the next, it's impact on inflation is not going to be as big as if it is high for two years. In the second chart I present the history of consumer price inflation on a rolling 12-month basis, in order to back up my choice of rising and falling inflation periods in the first chart. There are quite a few conundrums that jump out of the first chart. First, M2 growth in the 1970s was about the same as it was in the early 1980s (about 9% a year on average), yet inflation rose sharply in the 70s and fell sharply in the first half of the 80s. Inflation then rose in the second half of the 80s, even though money growth slowed down throughout the period. The early 90s is a difficult period to deconstruct, due to the impact of FIRREA on the banking system, but it does appear that faster money growth through most of the 90-2003 period corresponded to falling inflation. Finally, we see relatively slow money growth from mid-2003 through mid-2008, yet inflation accelerated. If a novice were to draw conclusions from this, he or she might say that slow money growth leads to rising inflation, and fast money growth leads to falling inflation. That would of course run directly counter to everything that Milton Friedman taught us, when he asserted time and again that "inflation is always and everywhere a monetary phenomenon." The source of the problem/conundrum here is that while M2 is an excellent measure of liquid money that is available to be spent, it is a much better of money demand than it is of money supply. According to the monetary theory of inflation, inflation occurs when the supply of money exceeds the demand for it; in other words, when the Fed supplies more money to the economy than the economy wants. (The Fed supplies currency and bank reserves to the system, but that doesn't mean the Fed can control the amount of M2. In the past year the Fed has poured $1 trillion of reserves into the banking system, but the increase in M2 has been comparatively very small, because banks have tightened their lending standards, and many corporations and individuals have been deleveraging their balance sheets.) If the demand for money is rising, the Fed can accommodate this—by allowing money growth to rise—without faster money growth being inflationary. Conversely, if money demand is falling but the Fed fails to offset this by tightening policy (the situation we find ourselves in today), then money growth can slow and inflation can rise. The key to figuring out whether Federal Reserve monetary policy is inflationary or not lies in determining whether the Fed is oversupplying money or not. But you can't tell this by looking at M2 growth. One of the key insights of supply-side economics is that free markets are excellent sources of real-time indicators that can be used to tell, for example, whether monetary policy is inflationary or not. It's rather simple: if there are too many dollars in the system, then we would expect to see some or preferably all of the following: a) the value of the dollar falling relative to other currencies, b) gold prices rising, c) commodity prices rising, d) the yield curve steep or steepening, e) credit spreads tightening (since easy money is great for debtors and should reduce default risk), f) inflation expectations as embodied in TIPS prices rising, and g) currency growth falling (currency becomes a hot potato when inflation rises, so the demand for currency should fall). All of these are symptomatic of a situation in which the supply of money exceeds the market's demand for money. Since we have been seeing most or all of these rising inflation symptoms for the past year or so, that's why most supply-siders have been predicting rising inflation even though M2 growth has slowed down rather remarkably (M2 growth is essentially zero over the past six months). Caveat: this is a highly contentious issue about which reasonable men can and do disagree. It's amazing to me that the market seems awfully concerned about the recent rise in the dollar's value. This chart shows what is arguably the best measure of the dollar's value against a large basket of currencies, since it is both trade-weighted and inflation-adjusted. At the end of November the dollar was trading (for the fourth time in history) at its lowest level ever. Today it is up about 3% from that low. How can this possibly be construed as a bad thing? 1) An ever-weaker currency does not lead to a stronger economy by way of boosting exports. Big downward moves in a currency can eventually lead to rising exports (the J-curve effect), but a depreciating currency also makes imports more expensive. Spending more on imports can offset whatever benefits there may be from rising exports. 2) An ever-weaker currency inevitably leads to rising inflation. The basic definition of inflation is a decline in the value of a nation's unit of account. Rising inflation throughout the economy can more than offset whatever gains there may be in the export sector. 3) An ever-weaker currency discourages investment, and without investment it is very difficult for living standards to rise. Who wants to invest in a country whose currency is falling? A depreciating currency can wipe out investment gains. 4) A weaker currency not only discourages investment, it encourages price speculation. A weaker dollar has helped boost commodity prices, and that in turn attracts commodity speculation. Speculative activities do not necessarily create a more productive economy, and many times they simply result in a transfer of wealth. Speculators play a very important role in keeping markets liquid and efficient, but when everyone starts speculating on price increases, you know that fewer people are paying attention to the investment that is essential to boosting the productivity of labor. The good thing about a strong and stable currency is that it reduces the rewards to price speculation, and that in turn forces the market to direct its resources to productive investments. 5) The dollar's rise from all-time lows is at least partially due to the expectation that the Fed will begin raising interest rates sooner than previously expected. Higher interest rates, coming off a base of zero, can hardly be considered a threat to economic activity. On the contrary, higher interest rates directly benefit the majority of U.S. households, since the household sector has significantly more floating-rate assets (e.g., bank CDs and money market funds) than floating-rate debt (e.g., adjustable rate mortgages, now at risk of extinction). Interest rates would have to be hugely higher for a long time—and the yield curve inverted—before they posed a serious risk to economic growth. This chart shows the breakeven inflation rate for 10-year TIPS (aka the market's 10-year expected inflation rate). It's simply the difference between the nominal yield on 10-year Treasuries and the real yield on 10-year TIPS. As should be obvious, after collapsing last year, inflation expectations have rocketed higher this year for a rather spectacular comeback. Inflation expectations haven't completely returned to the levels they were registering several years ago, but at this rate it won't take much longer to get there. In one sense, however, inflation expectations are already breaking out to new highs, as shown in this next chart. 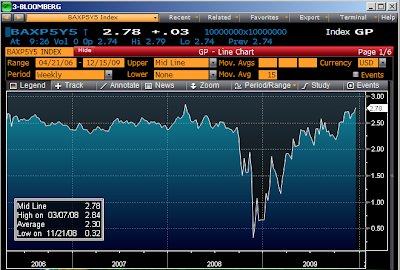 It's the market's 5-year inflation expectation 5 years forward, as calculated by Barclays. It's now as high as it has ever been, with the brief and tiny exception of Mar. '08, and it looks like it's headed higher. In the annals of inflation, this past year—in which inflation expectations collapsed to zero only to fully rebound 12 months later—will undoubtedly go down as one of the great deflation head-fakes in financial history. I can't resist referring back to my posts of late last year, in particular this one, in which I argued that "TIPS are a steal" because the market was projecting zero inflation but the Fed was hell-bent on reflating. If I were running the Fed, my message to fellow governors would be "OK, guys, job done: inflation expectations are back on track, now we need to get interest rates back on track." Industrial production has surged at a 9.3% annualized rate since the recession ended late last June. Consumers are getting back their spending mojo, and factories are gearing back up after having shut down in a panic. This is just the standard stuff of any recovery. Factories still have tons of idle capacity, but that just means that revving up production is relatively cheap and painless—no need to go out and build new plants, just turn the machinery on. Today marked a milestone of sorts: the S&P 500 hit a new closing high for the year, even as the dollar traded about 3% above its November lows. For almost all of the past year or so, there has been a strong inverse correlation between moves in the dollar and equities. Now we see that relationship possibly beginning to break down. If this continues, it could have some very significant consequences, although there is some fundamental disagreement about what those consequences might be. To sort through the consequences of a new relationship between the dollar and equities, consider first that the "carry trade" is a popular theory for explaining the inverse correlation between the dollar and equities and other risk assets to date. According to this theory, a weaker dollar is a sign of people borrowing dollars and investing the proceeds in equities and other risky assets such as commodities, oil, gold, and other currencies. By keeping short-term interest rates close to zero, the Fed has provided tremendous encouragement to this trade, and this in turn is supposed to facilitate an economic recovery by pumping money into the system, reducing credit spreads, and boosting U.S. exports. However, it brings with it some very unpleasant inflation consequences, and it also means that the recovery is fragile, since it is built on a foundation of speculative activity rather than investment. Those who believe in this theory worry that a stronger dollar and/or a tighter Fed will shut down the carry trade, and thus expose the economy to a painful economic relapse. I've explained the inverse correlation between the dollar and equities quite differently, keying on the demand for money. I've documented in a series of posts how changes in the value of the dollar since early 2008 have corresponded to changes in the demand for money (which is of course the flip side of money velocity). The dollar rose last year as money demand soared; this was reflected in a surge in the amount of dollar currency outstanding, a surge in the M1 and M2 measures of money supply; and a severe contraction in nominal GDP. Just the opposite has occurred since last March: money demand has declined, the dollar has weakened, the growth of dollar currency, M1 and M2 has dropped to near zero, and nominal GDP has picked up. In short, money that last year was hoarded was returned to circulation this year, thus boosting the level of economic activity. Declining money demand this year was thus symptomatic of a return of confidence and a portent of improving economic conditions in general; rising prices of equities and other risk assets were all simply the natural result of an improving economy. It is also the case that there has never been a stable or enduring correlation between equities and the dollar. So if the correlation going forward becomes positive instead of negative there is no reason in principle to be concerned. In the current situation, however, I think that a positive correlation between equities and the dollar would be a good indication that the economy was improving on its own merits, without help from money demand or the Fed. Since markets have been deeply distrustful of the economic improvement to date, and just as convinced that the Fed will have to keep interest rates at zero for a very long time, any signs that the economy is experiencing genuine growth directly contradicts the market's fundamental assumptions. We have seen hints of this already, in the form of declining unemployment claims and sharply reduced job losses, plus broad-based strength in commodity prices, and of course all the V-signs that I've been posting about for months. A stronger than expected economy would inevitably lead the market to demand more equity exposure, at the same time it would lead the Fed to tighten sooner than expected. Rising interest rates need not pose any great risk to the economy in my view; indeed, rising interest rates would be a very welcome indicator of economic health and vitality. And of course, as a supply-sider I am a firm believer in the concept that a strong currency is always better than a weak currency. And since the dollar currently trades at historically low levels relative to most other major currencies, a stronger dollar would be doubly beneficial, since it would mark a badly-needed return of confidence (which would bring with it increased investment), as well as a lessening of inflationary pressures. This chart puts the past 100 years of inflation into a context you've unlikely seen before. The message of this chart is that the "best" days of inflation are in the past. By best, I mean the times when inflation was low and relatively stable. The best decade, as shown in this chart, was the 1990s, with the second-best being the 1960s. The current decade is only the fourth-best. The volatility of inflation has picked up in the past decade, even though the average level of inflation has been relatively low (2.6%). This volatility was driven apparently by extremely volatile energy prices, but energy price volatility arguably was driven by erratic monetary policy. The Fed can (and usually does) blame unwanted or volatile inflation on external factors beyond their control, but ultimately the Fed bears the responsibility for the level and variability of inflation. 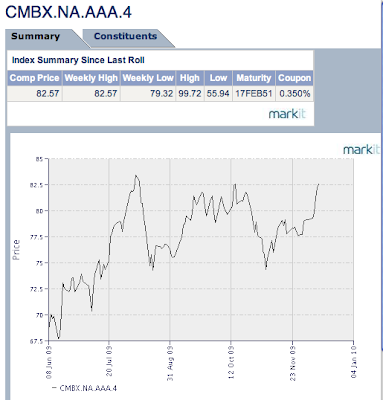 Here's a graph of the price of a AAA-rated commercial mortgage-backed security index that is published by the folks at markit. Earlier this year, prices fell as low as 56, whereas today they are over 82 and rising. That's an impressive gain, and it comes despite the ever-increasing drumbeat of concern for commercial real estate. What this means is that the market was way too pessimistic earlier this year about the prospects for commercial real estate loan defaults. Even though defaults are likely to rise next year, they are now projected to rise by less than previously expected. This ties into a reply I made on a recent post comment, to the effect that rising default rates are not likely to be bearish for the market or for the economy, since the market has already discounted those losses. Enormous losses have been booked already in our forward-looking markets; what remains to be seen is whether the actual losses are more or less than what has been anticipated. Moral of the story: don't look at the level or even the projected level of CRE defaults, look at the behavior of the prices of securities that will be affected by those defaults. On that score things are getting better even though defaults are rising. The political headline this week is that President Obama appears to be attempting to move toward the center, or what he believes is the center. We saw the big pivot in two major speeches, one on the economy and the other, in Oslo, on peace. If it is real, ... it tells us White House internal polling is probably worse than the public polls. It tells us the mounting criticism from Republicans, conservatives and others has had a real effect. It tells us White House officials have concluded they were out on a cliff. The economic speech took place Tuesday at the Brookings Institute, the generally left-leaning think tank in Washington. The president put unusual emphasis on—and showed unusual sympathy for—Americans in business, specifically small businesses. "Over the past 15 years, small businesses have created roughly 65% of all new jobs in America," he said. "These are companies formed around kitchen tables in family meetings, formed when an entrepreneur takes a chance on a dream, formed when a worker decides it's time she became her own boss." This is how Republicans, moderates and centrists think, and talk. The president claimed success in reducing taxes—"This fall, I signed into law more than $30 billion in tax cuts for struggling businesses"—and announced a new cut: "We're proposing a complete elimination of capital gains taxes on small business investment along with an extension of write-offs to encourage small businesses to expand in the coming year." He called it "worthwhile" to create a new "tax incentive to encourage small businesses to add and keep employees." All this was striking, and seemed an implicit concession that tax levels affect economic activity. It was as if he were waving his arms and saying, "Hey taxpayer, I'm not your enemy!" The only reason a president would find it necessary to deliver such a message is if he just found out taxpayers do think he's the enemy. The emphasis on what it takes to start and build a business, seemed if nothing else, a bowing to reality. And if you're going to bow to something, it might as well be reality. Thursday, at his Nobel laureate speech in Oslo, the president used an audience of European leftists to place himself smack-dab in the American center. He said, essentially: War is bad but sometimes justified, America is good, and I am an American. He spoke of Afghanistan as "a conflict that America did not seek; one in which we are joined by 43 other countries—including Norway—in an effort to defend ourselves and all nations from further attacks." Adroit, that "including Norway." He said he had "an acute sense of the cost of armed conflict" and suggested America's efforts in Afghanistan fit the criterion of the concept of a "just war." It continues to be of great value that a modern, left-leaning American president speaks in this way to the world. "The world" didn't seem to enjoy it, and burst into applause a resounding once. Here's yet another V-sign (and a very graphic one at that): the impressive strength in retail sales over the past six months. This, despite 10% unemployment and a significant amount of "resource slack" in the economy. What it means is that there are still an awful lot of people working; they have been working harder and more productively, and their incomes have been rising faster than inflation. In addition, their confidence in the future has risen, so some of what they are spending is money they had hoarded last year when the future looked disastrous. According to the Federal Reserve, in just six months following the low of last March, households' net worth has increased by almost $5 trillion, or 10%. Household debt fell by almost $60 billion, the value of household real estate holdings increased by over $600 billion (yes, increased! ), and thanks to a strong stock market and increased savings, households' financial assets increased by $4.2 trillion since last March. Moreover, in the six month period ending Sept. '09, household disposable personal income rose by $235 billion, owner's equity in household real estate rose by nearly $1 trillion (yes, one trillion! ), and owner's equity as a percentage of household real estate rose by 12%. This is an impressive and across the board improvement in key indicators of households' well-being. We've still got a ways to go to get back to where we were in 2007, but we're making excellent progress. That's one more thing to be thankful for as we approach the holiday season. The federal budget numbers improved again in November (on a rolling 12-month basis), mainly because spending in recent months was less than the extraordinary levels of spending in October and November of last year. Nevertheless, it remains the case that both spending and tax revenues are "off the charts" for the post-war period. You have to go back to the early 1940s to find spending running at a higher share of GDP than today, and tax revenues running at a lower share of GDP. That was the time (WW II) that our debt/GDP ratio reached its highest point ever: almost 120%, whereas today it is about 54%. So today's figures are not actually unprecedented, but they are close. The last chart puts the current budget picture into vivid relief. Spending is out of control due to bailouts, stimulus spending, and a robust increase in ongoing government spending and involvement in the economy. Revenues are extraordinarily weak thanks to the sharp economic downturn and only a few months of modest recovery. From a supply-side perspective, what I would like to see is a cancellation of the stimulus spending, since it has already proved itself ineffective, and the application of the recovered funds to increase the private sector's incentives to work and invest. At the very least we should have a lower corporate tax rate to allow our businesses to compete in the world, and we should not allow the Bush tax cuts to expire at the end of next year. I think these two simple steps—calling off the stimulus, freezing tax rates at current levels, and reducing the corporate tax rate—would be a tremendous boost to confidence and investment, and would thus give the economy the "kick-start" that everybody seems to want.